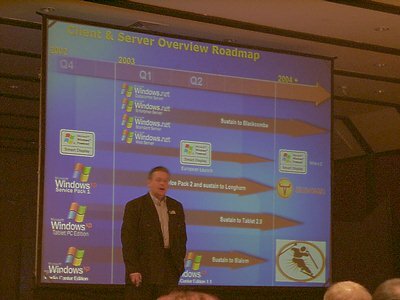 Chaintech Evolution Event 2003 was held by Chaintech in February on Tenerife island (Spain). Chaintech is a well-known mainboard and graphics card maker; it doesn't fit into the Top Four in production volumes but it is one of the second-echelon heavyweights. 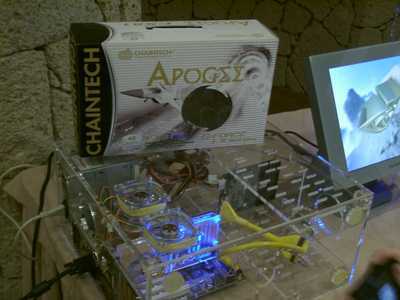 Traditionally, Chaintech's products were of high quality but had no bells and whistles. 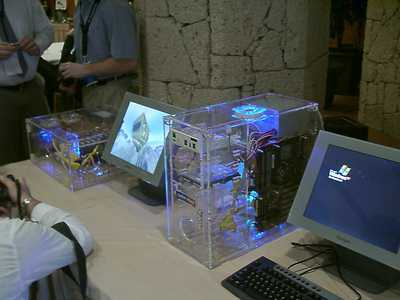 The moderate prices made some of its mainboards extremely popular with users, starting with legendary 6BTM. 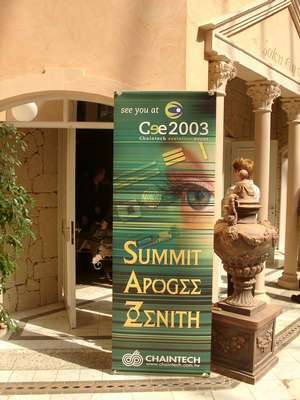 However, last year the management decided to enter the top market and, with this purpose, divided the mainboard line into three: Zenith, Apogee and Summit. 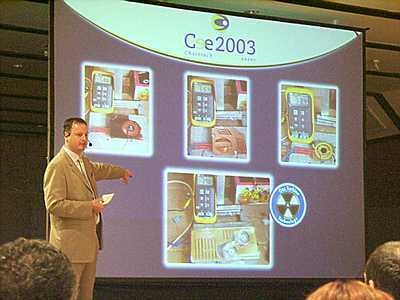 Our regular readers could see the new Chaintech's solution at our site, and now we suggest that you have a look at what they demonstrated at CEE'2003. 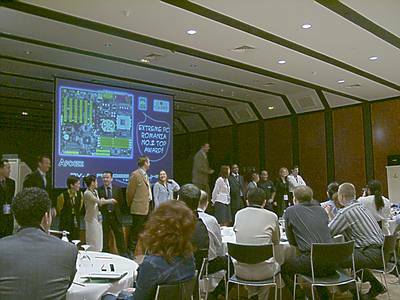 The event took place in one of the best hotels of the island, in a large presentation hall. 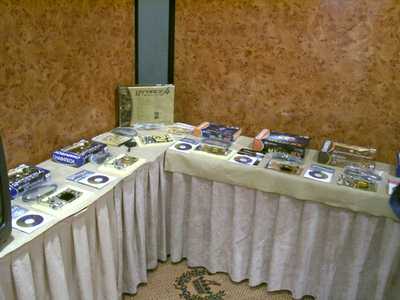 Along the walls were the tables with mainboards (a bit later we will have a closer look at them) and video cards starting from the first NVIDIA's chips. 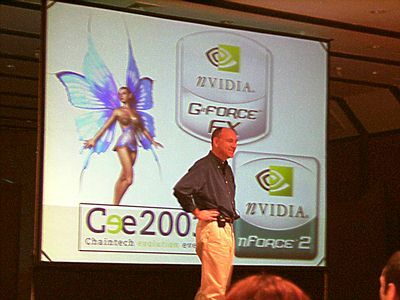 Near the entrance in a darkened corner was Chaintech's pride and Number One of the presentation - NVIDIA's GeForce FX based Apogee FX81 graphics card. 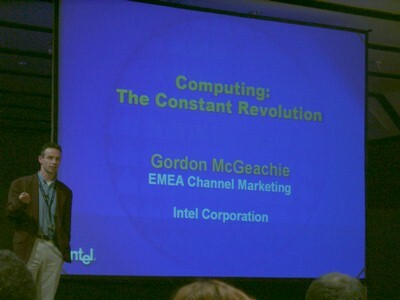 The first expert who took the floor was Geert van Dijk from Chaintech. I'm not going to retell the speeches but draw your attention only to the most interesting things. 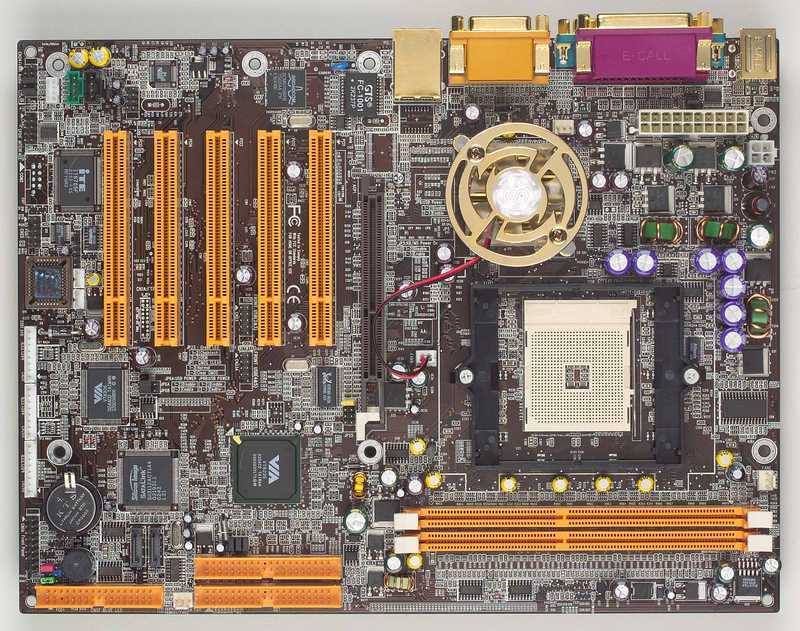 The volume of mainboards for Pentium 4 is not that great - about 35%, mostly at the expense of the mainboards for AMD processors. The share of products based on VIA chipsets surprisingly makes nearly 60%. It's far different from the top four companies. For example, ASUSTeK has it only slightly over 10% (however, ECS has about 60% of SiS based products). 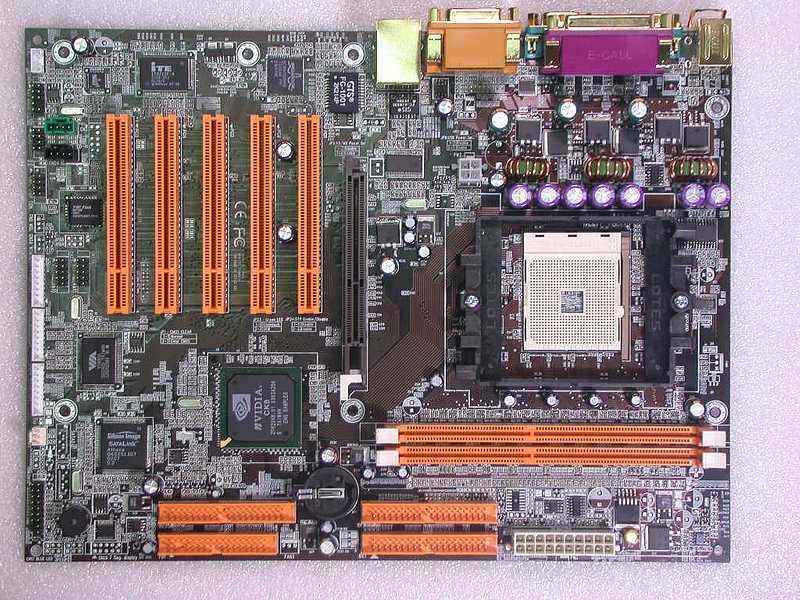 Most of these Chaintech's boards are Pentium4-oriented models on the P4X chipsets. Three major companies can't afford it due to some reasons. Geert focused on the Zenith and Apogee lines. 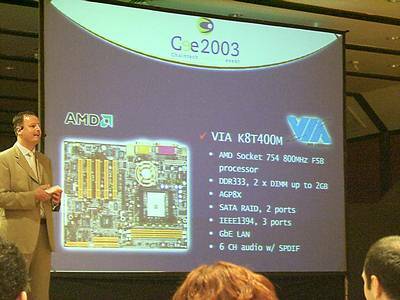 I must say that development of proprietary unique solutions is an obvious attempt to stand against the tendency of making mainboards looking like two peas in a pot. Just remember, ASUS's Black Pearl and Solteks' Golden Flame. A stylish box, an effective textolite design, specific cable coating, a rich software bundle and other pleasant things attract a lot of buyers who have transparent or semitransparent PC cases. The accessory packs of Apogee series with C-Box panel and pretentious headphones and Zenith series with C-Box2 panel (that monitors CPU temperature), longer cables and multiple additional brackets with interface connectors look nice as compared to their competitors (for more information go to Chaintech 7NJS (Zenith) and Chaintech 7VJL (Apogee) reviews. The most interesting latest solutions are models based on VIA's and NVIDIA's Athlon 64 chipsets announced quite a while ago. AMD keeps on putting off the release of these processors and the developers have every chance to smooth out even slightest imperfections. I hope this fall we will test them, and now I have only some information about the future debutants. 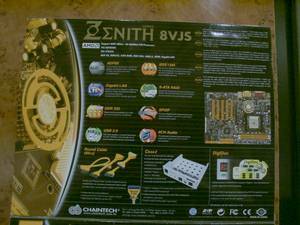 Zenith 8VJS: VIA K8T400M chipset (AGP 8x), SATA RAID, Gigabit Ethernet, FireWire, 6-channel audio controller (C-Media) with S/PDIF support. 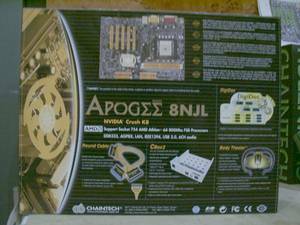 Apogee 8NJL: NVIDIA Crush K8 chipset (AGP 8x), Fast (Gigabit?) Ethernet, FireWire, 6-channel audio controller (C-Media). The company says the release of the new series was followed by the fast growing sales. 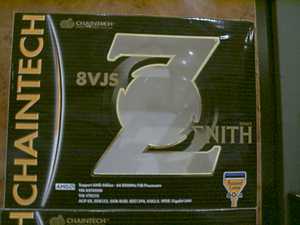 But do remember about the remaining Chaintech's solutions which are now forcedly brought into the Summit series. Most of them are even deprived of their own color for expansion slots and memory and look like plain models mostly of the mATX format; actually they brought fame to the company. After that he turned to Chaintech's intentions in the video sphere. 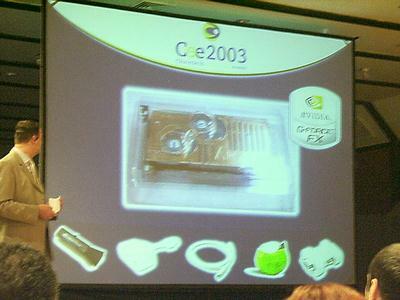 The market of discrete chips for desktop accelerators is actually shared by NVIDIA and ATI, and all manufacturers of finished products went either into one or the other camp. Chaintech backs the Californian company whose current top product is GeForce FX. 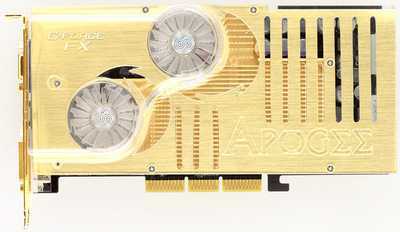 The first Chaintech's card built on this pretty expensive chip opens a series of Apogee's graphics cards - Apogee FX81. I'm not going to focus on GeForce FX's features, just remember that this is a top product both in price and capabilities, that is why Chaintech is eager to promote it as a half-elite solution granting more than simply an ordinary printed-circuit board bundled with a sheet of documentation. 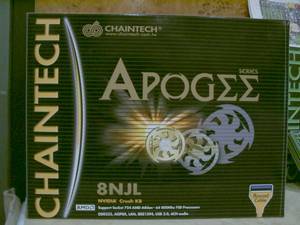 Apogee FX81 comes with a CD with drivers and other software, Video-In/Video-Out adapter, S-Video cable and DVI-VGA adapter. Beside the expected stuff Chaintech bundles some exclusive things. First of all, this is a soft duster for coolers (it really comes in handy for the two-fan Apogee FX81), and secondly, a special soft ball for dust removal from a display, - this accessory was added at the suggestion of our PR and Marketing Director Alecs Lagounenko. Beside these funny stuff, Chaintech's card has some more important differences from the GeForce FX's reference cooler. 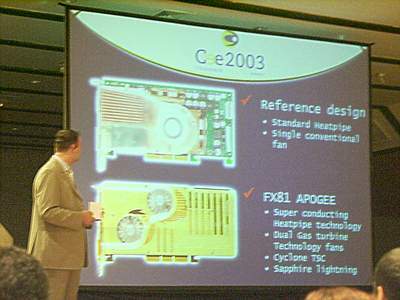 The card is also two-level, but they focused on the new cooler's technology using heat-removing pipes with improved heat conduction and two fans. Our Test Lab will estimate its efficiency, but the engineers at Chaintech state that the Gas Turbine Technology is more effective than standard analog solutions by 50%. 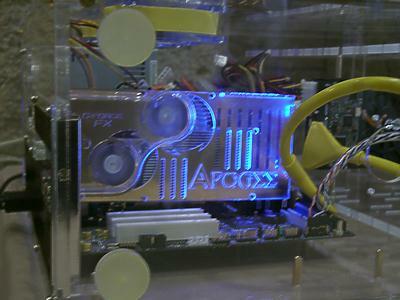 In addition to all the pleasant things users can admire the sapphire lighting during operation of the graphics card in the dark. The Geert's speech was followed by reports of the rest. Thus, Michal Lisiecki, VIA Technologies, shed some light on the company's future plans. 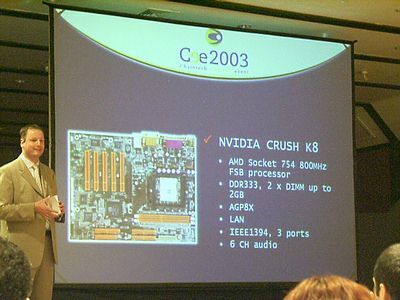 There was nothing new, but those readers who don't check news regularly might be interesting in VIA's discrete chips for Pentium 4 (there is only PM400T = PT400 + CastleRock-II which is expected as an integrated solution). PT400 is remarked P4X400 with the supposedly official DDR400 and 800MHz CPU bus support, and PT600 will add a dual-channel memory access including DDR400 and speed-up traffic between the bridges. 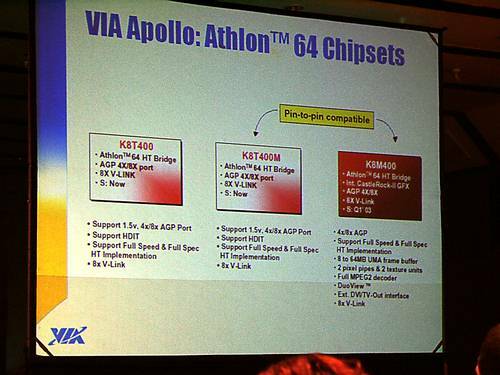 In spring VIA will launch KT400A for ordinary Athlons which will provide official support for DDR400 (after the expected acceptance of PC3200 specification) and will be used together with the updated VT8237 south bridge. 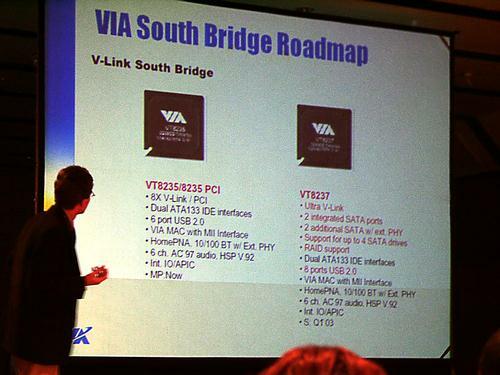 The bridge supports up to 4 Serial ATA devices, SATA RAID and up to 8 USB 2.0 ports. One more small break, and we were carried away with the NVIDIA's show demonstrating GeForce FX that left everyone amazed and excited. The information about the similar presentation held in Moscow and the following close-up of the new accelerator are available at our site, as well as the materials concerning nForce2. 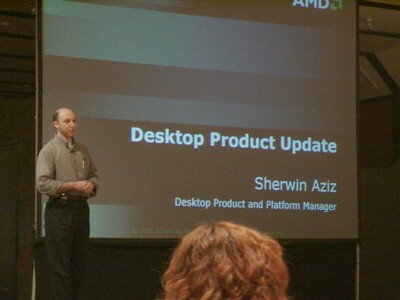 Sherwin Aziz, AMD, highlighted the roadmap concerning desktop processors. 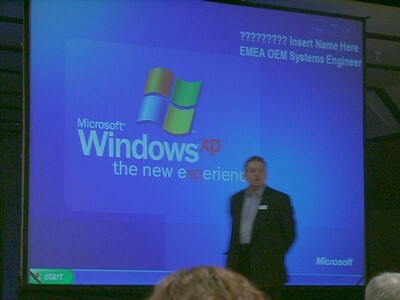 The event took place before the official release of Barton core of Athlon XP (now you can find the in-depth review of this core at our site), and this solution got so much attention there in contrast to Athlon 64.
who glibly told us about prospects of all OS families and about their vision of future of mobile computers. That's all, and I want to express my gratitude to all guys from the Chaintech headquarters in Europe for such an interesting event. P.S. 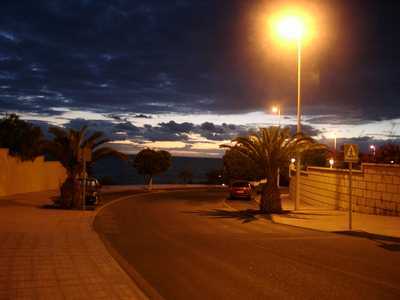 Toward Russia... from Tenerife.